What can you make with a toilet paper roll, duct tape, and a graphing calculator? 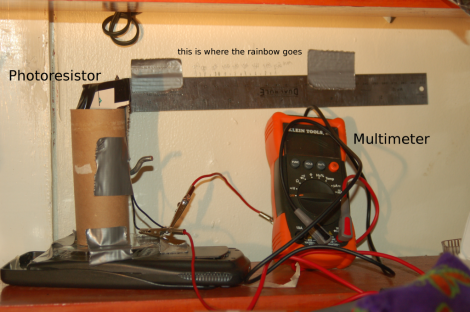 A stand for your homemade spectrometer. This is neither as pretty nor as accurate as a precision scientific instrument, but that doesn’t mean it’s useless. In fact, it works perfectly well for rudimentary observations. Light is shined through a sample solution, passes through a diffraction grating, then shows up as bands of color on the projection surface seen above. The photosensor mounted on the cardboard tube was pulled from a night-light, and is read using the ruler and the multimeter. This results in two data units that are used to graph the results. As long as you’re running test samples as a control this simple setup will yield useful information for the scientist on a shoe-string budget.